For yesterday’s show on Wharton Moneyball I took a look at how expectations differed between “Experts” and “Algorithms”. I.e., the coaches and writers who vote in the two main polls versus analytics-based models like ours. To do this I just took the average points in the Coaches and AP polls, and compared that to the average score in Massey-Peabody and ESPN’s FPI (the best predictive model we know of besides ours). There is of course a strong positive relation between the two, and some that fall exactly on the trend line between them (Alabama, Georgia, Missouri). 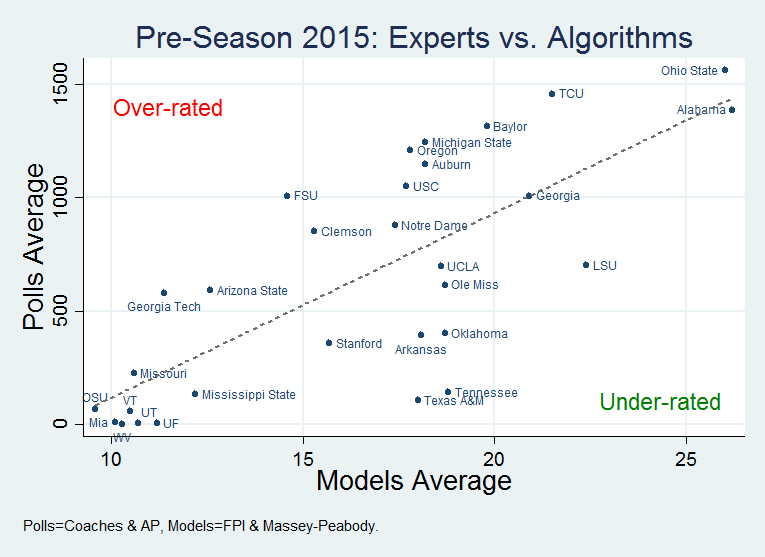 But there are also teams that Experts like quite a bit better than the Algorithms do (Florida State, Oregon, Michigan State), and some that Algorithms like better than the Experts do (Texas A&M, Tennessee, Oklahoma, LSU). For obvious reasons we consider the first group “Over-rated” and the second “Under-rated”. This puts us squarely in the camp of those who’ve been singing the praises of the Aggies and Vols. It also puts us into all-too-familiar territory with the Noles, warning the world not to take them too seriously. Some of the difference could be driven by strength-of-schedule considerations, if the voters consider the poll more of a forecast than a power rankings. After all, all 7 SEC West teams aren’t going to end up in the Top 10. We’ll look at that next.